How sad that in the absence or arguments, a programme or proposals, that there are those who try to scrape up votes by lying and misinformation. Those who have followed me throughout this legislature know that since I took office as member of the Alicante Provincial Government I waived charging a single cent of salary to Xàbia Town Hall or to the municipal water company Amjasa. The funds are allocated at the beginning of the legislature but my salary allocation was used instead for employment and social programmes. For those who have any doubts, I should explain that the law certainly does not allow two “salaries” from government. But it says nothing about the payments received by public officials for attending plenary sessions or committee meetings; the board meetings of municipal companies etc… these are called ‘statutory indemnities’ and are perfectly legal to receive. The sum of these ‘indemnities’ which I could have received would have amounted to approximately 25,000 euros a year, but no, I did not take these payments; although legally entitled to them, I refused them. It’s not something that we all do, of course. You only have to look at what is done by the representatives of the political party, who see giving up my salary as a reason for criticising me. In the Marina Alta there are three other members of the provincial government, all from their party … can any one of them say that they only take payments from one administration? And another thing, they should ask their own representatives here in Xàbia whether or not they are being paid every month, their ‘statutory indemnities’ by the Town Hall and Amjasa. Or whether they have given up anything? Finally, suggesting that I have chosen to receive my MP’s salary because it’s the highest salary is a joke. Or are they taking us for fools and don’t think we know that the salary of the mayor and the councillors is fixed by the local politicians themselves? … Let me remind you of the salary of the last mayor their party had in Xàbia: 72,000 euros a year (so high it made the national news), and much higher than that of a Regional Member of Parliament. Anyway, as always, I’m going to look on the positive side of this matter, in that this political party has given me an opportunity to talk about this issue, something of which I am proud, and demonstrates that we are not all the same. 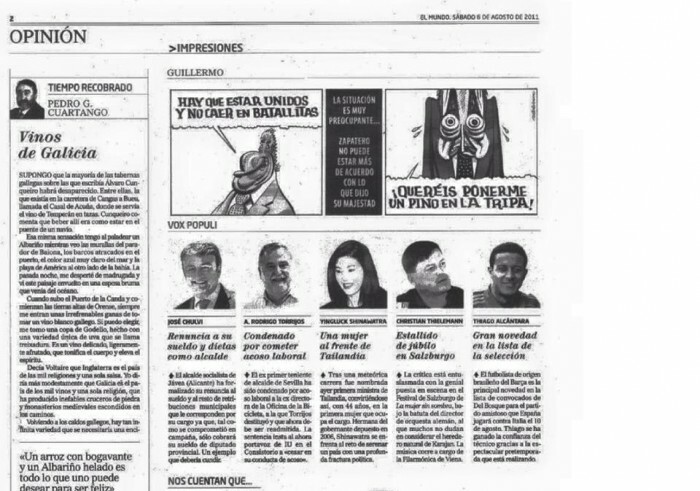 For your information I have attached a newspaper clipping from El Mundo (their national edition) which at the time reported the news of my renouncing my mayor’s salary. I’ll just continue with my campaign as usual, but will not tolerate insults, and leave lies unanswered.